The Head of the High Council of State (HCS) Khalid Al-Mishri said Egypt's President Abdel Fattah El-Sisi is intervening in Libya's domestic affairs in order to found a regime similar to that he commands in his country - "a regime of an iron fist." Speaking on Al-Jazeera TV Channel's "Liqaa Al-Youm" program, Al-Mishri said that he was surprised to learn in his recent visit to Washington that the US is not seriously tackling Libya's issues as part of their scheduled objectives. "All the reports given to the US officials were from the UN Security Council and UN organizations, thus shocking the officials to know of the massive impact of foreign interventions in Libya." Al-Mishri explained. Al-Mishri claimed to have had very successful results from his recent visit to the US, outlining the agreements he made with them regarding cooperation in different fields. He also said that France and Italy as well as Egypt all have interests in Libya. "France takes special interest in the southern region while Italy eyes energy resources such as gas. Egyptian president, on the other hand, wants a partner regime in Libya that is similar to his; a regime of an iron fist." Al-Mishri indicated. Talking about Khalifa Haftar, Al-Mishri said the former has been leading a coup on legitimacy since before the election of the House of Representatives, adding that Haftar would end democracy in Libya if he could and that he has no chance to have a role in Libya unless he gets elected by the Libyan people. "I object to the policy of war and killing that Haftar has been advocating since the beginning of his appearance on the scene." Al-Mishri added. He also talked about the current crisis in southern Libya, saying part of the problem is blamed on the Presidential Council (PC) which has not secured the region, thus leaving the borders open for Sudanese and Chadian rebel groups. "Southerners hosted Haftar's forces because they needed any party that can secure their cities and districts. After that, the PC tried to contain the situation, which is much better than having Haftar's forces in the south. "Al-Mishri added. 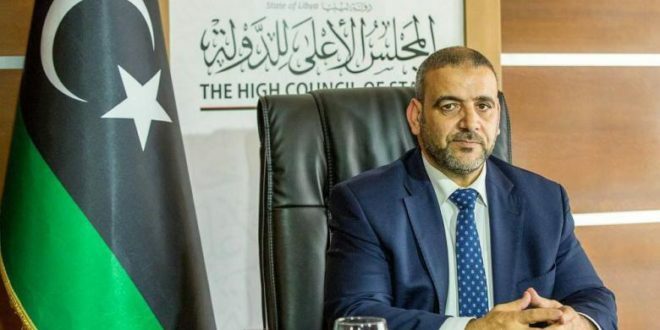 The Head of the HCS also said that they had given all needed guarantees to the UNSMIL for the holding of the National Conference, but "Haftar did not." "We at the HCS consider the constitution referendum a precondition for any dialogue, yet we are ready to drop this precondition to dialogue with all parties for the holding of elections and then have the referendum afterward." Al-Mishri further added.